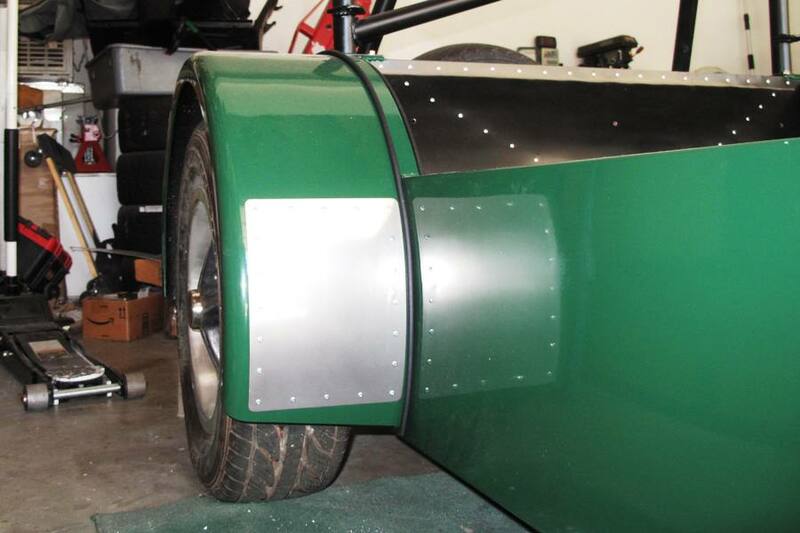 We finished up the last of the minor tasks this week, including fitting the rear fender guards, installing the battery, and painting the grill mesh. A lot of people thought we should paint the grill mesh black, and maybe we should've but we didn't. We painted it with Dupli-color silver wheel coating, which is horrible stuff but it's what we had in stock. So the grill mesh doesn't actually look painted, but at least it won't rust. Not soon, anyway. Neither will our new rear fender guards. 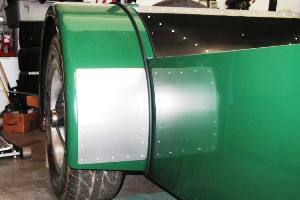 They're 18 gauge stainless steel, so they should outlast the fenders. We're not 100% sure why we put them on there, but just about every Locost has them, and we can guess they're probably some kind of stone chip protectors. But whether or not they do anything useful, we got them pre-cut, they were easy to install, and most importantly they look good. So we're happy with them. Although drilling through stainless steel will take its toll on your carbon steel drill bits. 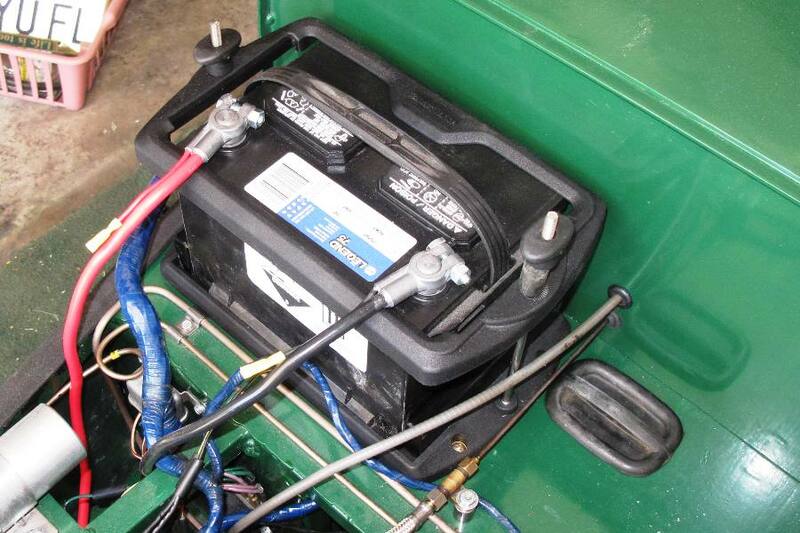 Two years ago we bought a new battery from Napa Auto Parts to get our MGB donor running. 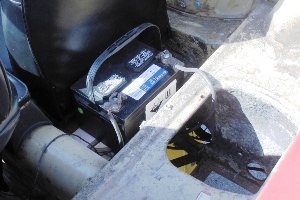 That battery has been sitting on the engine bay shelf of the Locost, where it's been starting the car easily for the past several months. As it turns out, the terminal arrangement on the battery is not optimal for the Locost. The positive terminal is on the outside near the ground plate, and the ground terminal is on the inside near the starter motor. So we never actually mounted the battery because we always planned to get another one. Of course we also planned to have a larger budget by now. But we don't. So we decided to go with what we've got. 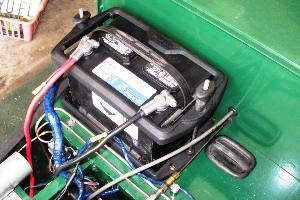 We already had a mount for the battery, a really nice one from West Marine, although it didn't quite fit the battery. It was a little narrow. So we had to either modify the mount, or modify the battery. We decided against modifying the mount, because it's kind of a permanent feature. Instead we trimmed a little plastic off one side of the battery, which hopefully won't compromise the integrity of the case. I'm sure it'll be fine. So the battery is finally tied down, and with that done and the other minor tasks out of the way, we're left with just our last five big items: seats, the windshield, front fenders, shocks, and driveshaft. We stretched the budget this month and ordered the shocks and front fenders, and also our high-dollar Lucas L488 turn signals to replace our cheap plastic turn signals. And with these last few purchases we have reached another major project milestone�we're all done spending money. Not "done" done of course, but our budgeting days are over. So now we can finally answer the question about whether or not we can afford this thing. The answer is yes, we can, but only just. We're not sure exactly how much we spent altogether. We have all the receipts and could probably total it up, but nobody wants to see any of that, and of course by nobody I mean me. But I think we went about this build project the right way, spending only what we needed to, when we needed to, and often making do with what we had. We could've easily spent twice as much, and not have had a lot more to show for it. We expect our five remaining tasks to take a little over 100 hours, which is pretty cool even if not entirely accurate. We realize that over the past couple of years we have not imbued our build plan with a lot of credibility. We abused it verbally, mocked it constantly, and changed it more than once. But it turns out that our original plan, built in Microsoft Project and published here way back in November of 2011, long before we had the donor or the frame or any of the suspension components, was very nearly on the money. So maybe we're close. In any case, from this point on we're going to try to complete one task a week, and finish the car sometime during the first or second week of October. We have a couple of things happening then, including a Miata track day on the 7th, but we're also taking some vacation time that same week, which should let us finish up anything we didn't get done earlier. And maybe even get all of our inspections and DMV paperwork out of the way.